Conflicts related to land and natural resources’ management have a long history in Nicaragua, a country where low levels of productivity per agricultural surface unit exist since soil and water utilization by big farmers are following extensive and predator patterns. In Nicaragua, half of the farmers do not own their land or own small and low quality plots. Inappropriate land use, poor access to it and the lack of articulation between national land policies and local land rights practices are at the origin of a strongly conflictive environment. 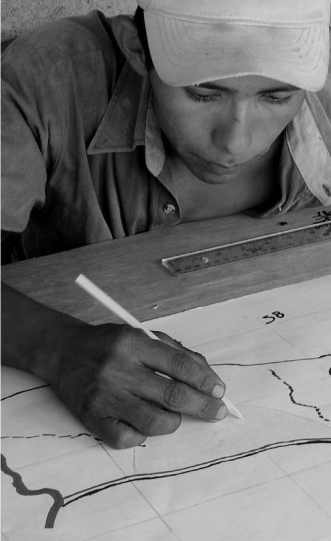 Communitarian cartography is a method oriented towards the prevention and resolution of conflicts related to land and natural resources’ access and use, through dialogue between all concerned actors. 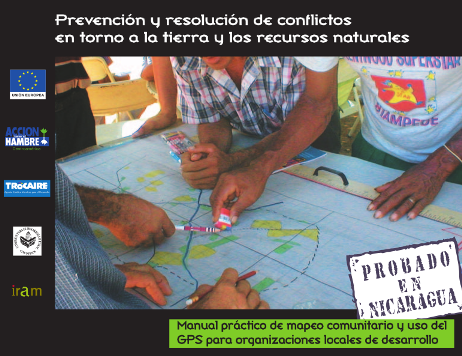 This manual was conceived as a capacity building tool for local development organisations that wish to use techniques of cartography and particularly the GPS as an agricultural measure tool for plot delimitation. The manual systematizes two local experiences implemented in the municipality of San Juan de Cinco Pinos (Chinandega) and the community of Santo Domingo (Madriz) since 2002 . Noémi Gonda and Denis Pommier wrote this handbook. It is published by Acción contra el Hambre and TROCAIRE with the support of the European Commission. This handbook is available only in Spanish. Download the handbook (4 files) through the links below. Noémi Gonda and Denis Pommier are members of AGTER.